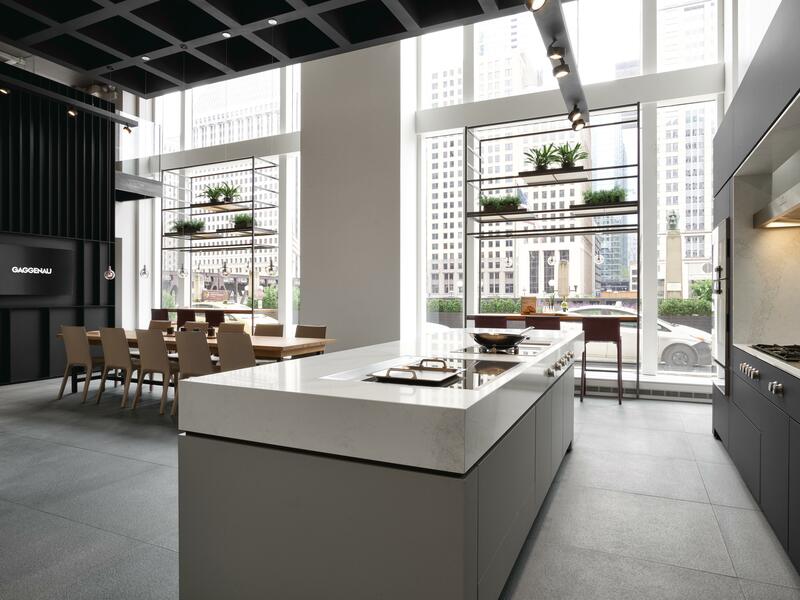 Gaggenau unveils flagship showroom in Chicago. 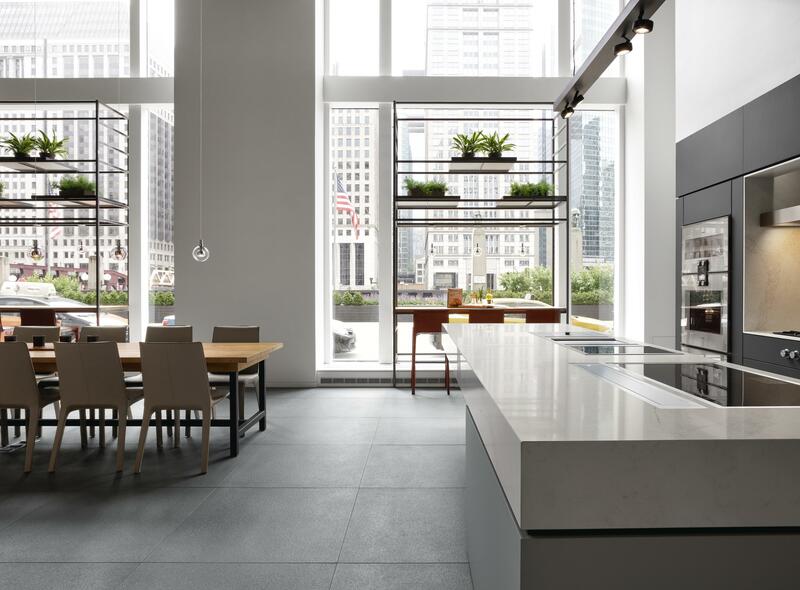 New Chicago showroom proudly reflects the architectural heritage of the “Heart of America”. The new space offers an extraordinary blueprint for a showroom, its 6 metre ceiling height creating a cube-like dynamic with a 3D feel. Natural light flows into the showroom through a vast expanse of glass that forms one entire wall of the space, overlooking the panorama of the Chicago River beyond. On entering the space, visitors are met with a marble heritage wall that presents the history of the brand’s origins dating back to 1683. 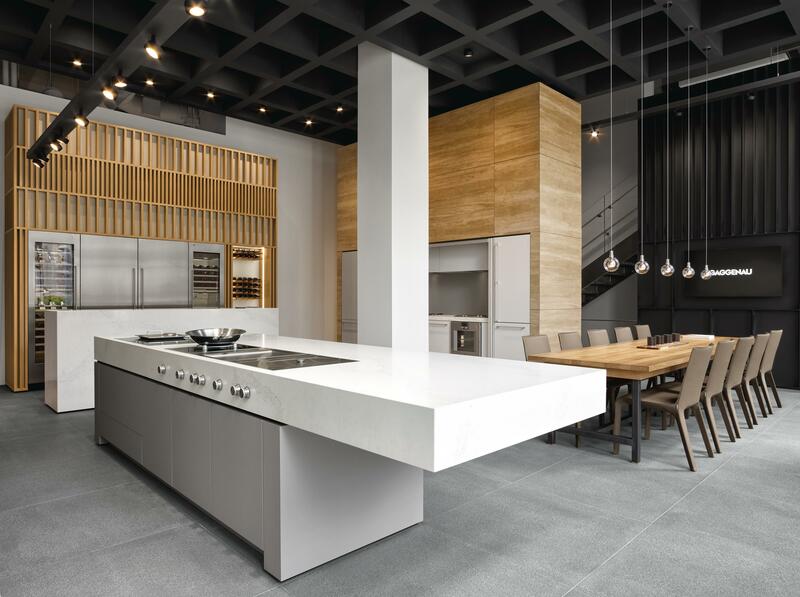 This affirmation of tradition is juxtaposed with the avant-garde grid design, where boldly carved out blocks and slices provide the perfect setting for presenting the latest Gaggenau appliances. More than simply a showcase for “objets d’art”, the space aims to inspire people with a passion for all things culinary and social. The creation of individual areas dedicated to culinary expertise, fine wines, and coffee culture – including live cooking zones – will draw visitors into the space and exemplify the sophisticated lifestyle that is central to the brand’s ethos. 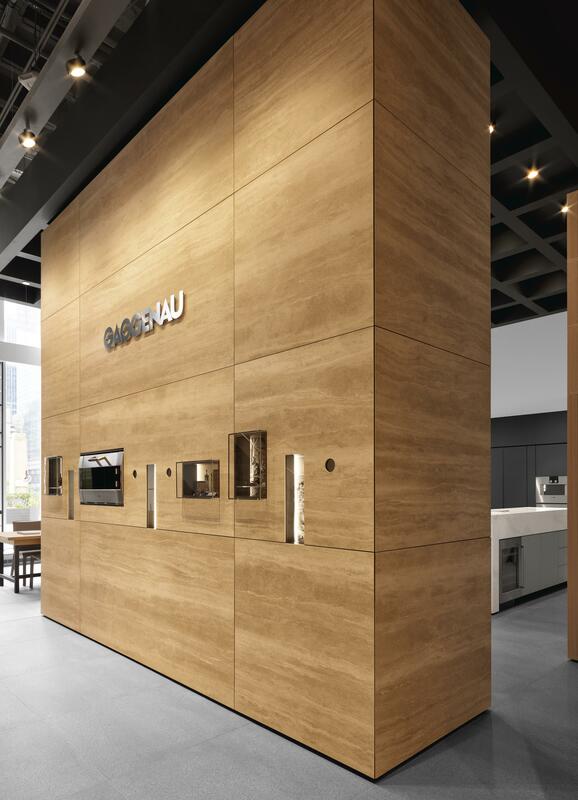 What holds true for the design of Gaggenau appliances applies equally to the showroom and building it is located in – bold, minimalist structures demand exceptional materials, lavish surfaces and textures, and clean contours. 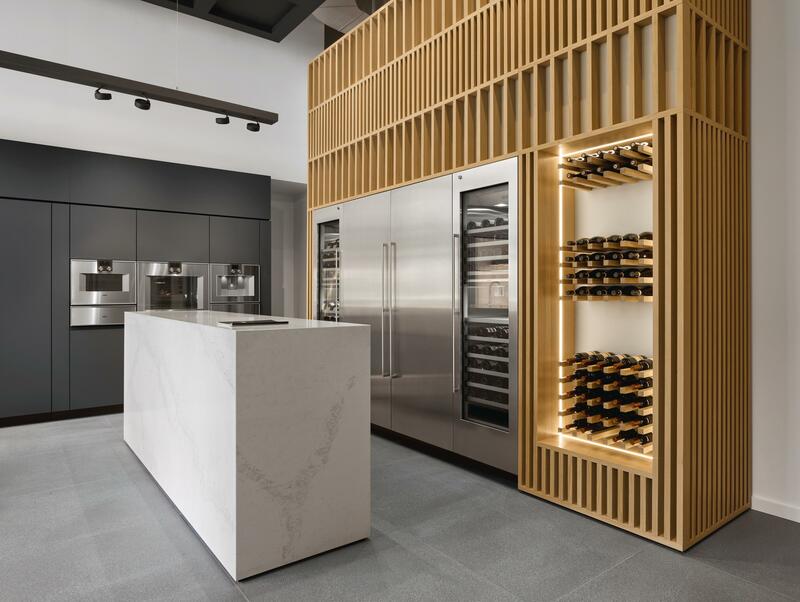 Smooth white marble, white oiled oak, travertine stone and ceramic tiles are combined with Gaggenau’s signature grey, dark anthracite and metal accents throughout, creating a truly tactile and immersive experience. 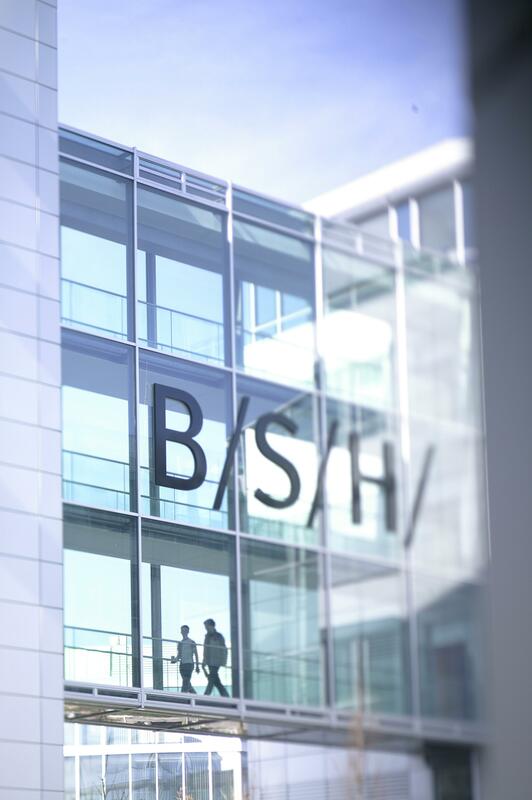 Gaggenau’s long-standing relationship with Munich architects einszu33 – responsible for the brand’s international showrooms – ensures the designers have an in-depth understanding of Gaggenau’s aims and the constraints of any given location. Under the direction of Hendrik Müller, the firm’s latest project with Gaggenau retains the brand’s ethos at the core of its design, drawing inspiration from the setting and integrating the project seamlessly into existing local culture and the surrounding architecture.